The regular occupancy for 3304 is 2, but 2 additional guests can be accommodated on a queen size sofa bed. The regular occupancy for unit 3303 is 2. The regular occupancy for 3303/04 is 4. $15 per additional guest over the normal occupancy number is charged per day (any more than the guests who can sleep in the beds). This charge covers our additional expenses in laundry, electricity, and the setting-up/breaking-down of sleeper sofas. Guests are obligated to disclose the actual number of occupants prior to arrival. We loved this condo! The view from our room & lanai was absolutely amazing!! Awesome sunsets & rainbows over Hanalei Bay! The room was clean & stocked with everything we needed to enjoy the beach or the room. The resort was super nice , as well. Great paved walkway down to the beach, lounging area on the grass overlooking the bay- great spot for watching the sunsets or stargazing while sitting by the fire! The pool & hot tub were awesome & the restaurant was super great with an awesome view!! We`ll be back! Laura from Pismo Beach, Ca. Our spacious lanai has a chez lounge with side table and two chairs. The two sides of the lanai are divided by tropical plants. You will be very comfortable sitting on this covered lanai taking in the sites! The bedroom has a King size bed with side tables and reading lamps. A custom made large teak desk with large lamp is perfect for those who need to do a little work while on island. This room also features a small fridge, 2 swivel chairs and side table, as well as a ceiling fan, A/C and an alarm clock. As you enter the condo the bathroom is to your left. A short hallway along a full size closet leads to the bedroom which opens on the lanai. The lanai faces west toward Bali Hai. The Resort grounds, amenities and staff were wonderful. I was disappointed in the condo, if you could call it that it was just a bedroom and bath with kitchen items in the bathroom. The toilet leaked every time it was flushed. The rugs in the bathroom were dirty. Seemed old and in need of updating. The best part was the lanai which has an exceptional view of the Bay. Thank you for your feedback as we do appreciate it. Thanks for noting the resort and staff were wonderful. The condo is advertized as a studio unit which is a bedroom and bathroom only and the website pictures show the exact room and what to expect and is detailed in decription and amenities. We will speak to the housekeepers about the bath mats. The owners of this unit come often and stay themselves so the decor is pleasing to them and again is showm clearly in the pictures. The view as you mention could not be more amazing and make this unit extra special! We appreciate you taking the time to post a review for the unit 3303 at the Hanalei Bay Resort. Thanks for noting the room was clean and stocked with all you needed. The views are pretty amazing and do set the tone for the whole vacation. The amenities at the resort are also great! We are glad to hear you will be back. You couldn't beat the view (which would rate a FIVE STAR) from Unit 3303 and the basic amenities within the room sufficed for us as a single couple. That being said, I gave this a three star rating because the room is in dire need of some updates esp with the wallpaper and the moldy smell from the A/C unit that is noticeable from the moment you walk in. Also, it would be nice to have privacy between the larger unit deck and Unit 3303's to enjoy a private coffee on the lanai without worrying that you're staring at the family next to you. The little row of plants did not suffice to provide adequate privacy. However, since my husband and I are huge Kauai and HBR fans, we were not in the room a lot and enjoyed the beautiful outdoors Kauai had to offer - snorkeling, hiking and bicycling. The unit was quiet and again, the view was unrivaled. Absolutely stunning in that regard. I believe with a little TLC and cosmetic touch-ups the room will be popular with even more potential travelers. Thank you. Thank you for your review and taking the time to post. The view is pretty amazing and does make it very special. The unit is clean and accommodating but the updates are a matter of the homeowners tastes as they do stay in the condo a few times a year themselves. The owners have also tried to come up with partitions to separate the lanais but they do not seem to stay in place so they have opted for the plants. We will look into the smell you spoke about and check the AC. Thank you again for your feedback as we do appreciate hearing from the guests and their comments. I recently visited Kauai and stayed at HBR #3303. Since it was a short stay and I was alone, I booked a 1-bedroom/studio. The unit needs a serious update/face lift, but the price was right so I was satisfied. The view was fabulous. The only downside was that the lanai was shared with the unit next door, and the only separation were a few potted plants, so there was little privacy. But the sunsets were worth it! Thank you for your feedback from your stay at the Hanalei Bay Resort unit 3303. Thank you for mentioning the view as it is pretty amazing. These units are individually owned so the updates and the design is a matter of taste and the websites do display the condo as it is exactly in description and multiple pictures for each guest to review and decide. The unit does have the perfect sunset view!!! The view from this condo is spectacular and worth renting for that alone. It is located close to the pool and onsite restaurant. Also, we found the added amenities to be helpful such as beach chairs, and a cooler/ice chest, in the unit, for guest use, made our stay more pleasant. I will rent the unit in the future. 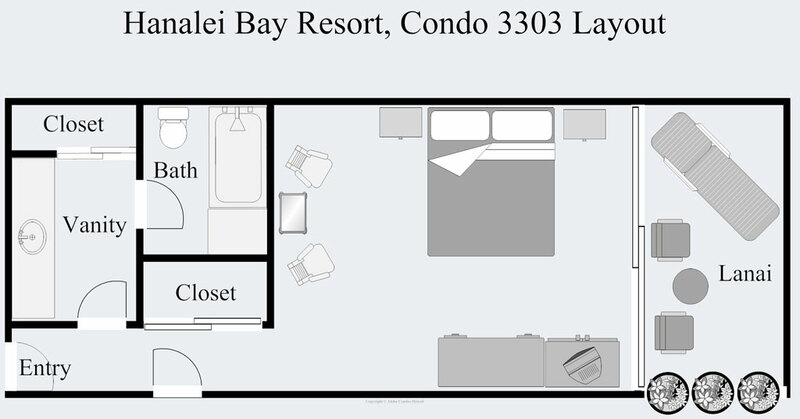 Thank you for the great review for the unit 3303 at the Hanalei Bay Resort. The views are really amazing and the sunsets are spectacular! The condo and the resort do have lots of great amenities to enjoy. We do hope you will come back soon! We absolutely loved the condo & especially the view! Once the restaurant is open, it will have everything. We had Christmas Eve dinner ar St Regis - church service at little green church in Hanalei, spent time at beach & pool and did last minute shopping in the village! Condo perfect and exactly as described on the website. Wouldn't hesitate in recommending to family and friends. The Happy Talk lounge bar was open with great food and prices. One night it was closed due to a private function so we ordered in Thai from the local cafe. That worked out really well. Hopefully I will be back soon to one of the most beautiful places on Earth. Amazing Property and Unit for Two! Amazing location and property! The view from the condo is superb and overall everything about this location is very easy and perfect for a weekend or week away! Beautiful location that has everything you need! This unit includes dishes, silverware, etc. as well as coolers, beach chairs, umbrellas, snorkel sets and beach toys. They also have a drawer full of Kauai travel books and books on Hawaiiana! Thank you for the wonderful review! It is a great location and we do try to have the unit equipped with everything for convenience. The views are beyond words! We are glad you enjoyed! The condo was terrific with an incredible view of the ocean and beach. The condo owner was terrific and extremely helpful during our stay. Highly recommend! Best view in Hanalei Bay Resort!! This condo has double sliding glass doors that open up to a balcony with 2 chairs, a chaise lounge, and small table. We sat and relaxed on the balcony while taking in the awesome view of Hanalei Bay and surrounding greenery. There is a coffee maker, a small refrigerator & microwave that was perfect for breakfast and lunch groceries. The pool is right outside the building, and close to the parking lot. The condo has an actual key that opens the door, so do not let the front desk provide you with a key card as they did us. We felt we got the best deal in Kauai with this gem! Thank you for your rating of 5! This is a great unit with a great view and we are so glad you did enjoy it! We are sorry the front desk gave you a key card. The resort has gone to a new system with key cards but the individually owned units mostly are still using a regular key for access. Thank you for your business and we do hope you will return again soon! Great location in Princeville. Convenient drive to Hanalei and the best part by far was the view. Also nice beach (shares the beach with St. Regis) and made grabbing drinks at the St. Regis for sunset very easy. The resort facilities are decent too with an okay pool and great hot tub. The unit itself is a little outdated. That being said, was perfectly fine for our purposes. Also, had great beach gear in the closet (chairs, snorkel, umbrella etc). That was amazing and really appreciated. The views of the bay, the ocean and mountains were stunning. The pool with waterfalls wereexceptional. The location was excellent and very safe. I was not aware that the restaurant and bar were under rennovation. The cabinet that contains the microwave has no handles and is very challenging to open. The door adjoining to the next suite is in dire need of repair and does not close. The staff were friendly and I will return next year hopefully with a small group. The lush vegetation of the valleys and the flowers were paradisical. Thank you for the review with a rating of 5! This is an exceptional unit and does have views that are second to none! We did notice that the shower curtain rod was down and had been broken when the housecleaners arrived and we have replaced it. We had the housekeepers look at the door issues you mentioned and they did not seem to have the same problems with them but we will keep an eye on them. The resort is beautifully landscaped and the amenities provided are wonderful. We do hope you will come again as you have mentioned. Thank you for your business. This condo was in an ideal location. Short walk from the parking lot and the pool as well as the sunset gathering spot. And it had an awesome view of the bay. The room was outfitted with everything I needed and more. Very reasonable rate. It was perfect! Overall the Resort is quite lovely with a very helpful staff. Thank you for the perfect review for the unit 3303 at the Hanalei Bay Resort. Wow could the view get any better. We are glad that you enjoyed the room and the view and found the staff to be helpful. We also are happy to hear the room provided you with everything you needed and you found the location within the resort close to everything. Please come again in the near future. Thanks again for your review. Top of our list for next stay. Amazing View! If only the room could match that. The view from this room was absolutely Amazing! It didn't matter - rain or sun, the lanai was the best part of this place. We stayed 3 nights here and made a point to watch sunset every night from our lanai. The room was alright, no major issues. The lighting could be improved to be brighter. It smelled very musty the entire visit. A 12-cup coffee maker would be an improvement over the 4-cup that was provided. There was only 1 spoon. The A/C worked very nicely. The "extras" in the closet were great- cooler and chairs. We had our own snorkel gear, but saw that there was some there as well. The walk to the beach was easy, but we did get a ride back up. All of the staff was very helpful and friendly. For the amount of time we spent in the room, it worked for us. If we return to Hawaii we will most likely go to a different island, not because of this stay though. The pool was gorgeous as well, however we didn't spend anytime using it as we thought we might. 3303 is the place to be!! We loved our stay at Hanalei Bay Resort, Unit 3303! The location of the unit is ideal for the price. Rooms here range in price and all seem reasonable. We chose to aim lower on the price and anticipated sacrifices in view or room to come along with that choice; fortunately that wasn't the case at all. Our room was steps from the parking lot which is great when you have luggage or groceries. If your room isn't as close they have 24 hour shuttle cart service to take you anywhere you desire at the resort (it's a BIG resort!). Our unit had a beautiful view of the bay and mountains. It overlooked one of the many tennis courts and path down to the beach. Steps away from our entry was the largest and prettiest of the resorts pools. The staff was helpful and friendly; the resort was immaculately manicured and beautiful. Our room was on the 3rd/top floor (there weren't elevators for this unit so if accessibility is a concern for you other options are available for you). Being on the top floor gave us cathedral ceilings, which made it feel more spacious. We were only there a few nights so we opted for the hotel style room (no full kitchen) but we had a mini fridge, microwave, and cabinet stocked with essentials like plates, bowls, cups, utensils, ect. ; All of which were very nice to have on hand. The bathroom was huge; we had a wedding to get ready for so I really enjoyed the space for hair and makeup hehe! The unit was clean and such a great deal for the price. -Parking is a tad limited but thats often the case regardless of where your vaca stay may be. -Roosters/chickens wander and squak - cockadoodledoing day and night. We couldn't hear a thing from our room! -We had the occasional gecko sneak into the unit - but that's good luck! -Resort is huge and the 7-10 min walk DOWN to the beach means a return walk UP. For some that's nothin' for others it just means you'll want to request the golf cart transportation. They go up and down all day, it's a great feature and is included in the additional resort fee. - there is an additional resort fee of $15/day that is applied upon checkout. It covers the transportation around the resort, pool use, towels, parking ect. BOTTOM LINE this place is beautiful and unit 3303 is the ideal spot to be. If (when) we make it back to Hanalei Bay Resort, unit 3303 is exactly where I'll choose to be! The view was fabulous, but the room felt old and dirty. It is a nice size for the money, but ceiling needs paint, wallpaper is peeling and needs to come down, the grout around the bathroom floor was black, and the patio furniture uncomfortable. It's a great unit, and the Hanalei Bay Resort is the best, but we will book another unit. Aloha and Mahalo for your comments. We are delighted you enjoyed the view and the spaciousness of this quaint condo as so many other guests have done with the custom teak furnishings and Hawaiian quilt bedding. Unfortunately due to the Trade Winds that blow in off of the water we are unable to leave cushions on the lanai, however we will consider options for more comfortable seating. The grout in the bathroom is colored a dark color on purpose to complement the color of the tile. We also intentionally have that particular type of wallpaper because we are able to clean the salt off of it. We have sent our handyman to check on areas where it might be peeling. This unit is a fantastic value with a great location. There are very few condos at HBR where you have a Bali Hai view and short walks to both the beach and the parking lot. Reviewed by Jim & Minnie H.
My wife and I were able to spend just a few of days at Hanalei Bay Resort, we only wish we could have stayed on longer. The incredible view of Hanalei Bay and Haena, paired with the stunning sunsets we witnessed each evening from our balcony of condo #3303 were the highlight of our vacation experience. Neither of us wanted to leave, but we will certainly be back! Thank you, thank you, thank you. We had a wonderful stay at the Hanalei Bay Resort in Room 3303. From picture I saw before going, I wasn't sure if the view would be what everyone said it was. Well it was a beautiful view of the ocean. Not right no the beach, however clear and unobstructed. We never made it to the beach because of a lot of rain and we wanted to spend our time hiking and exploring. The room was very quiet as we didn't hear anyone in the next rooms and I am a very light sleeper. The room is huge, has a microwave and small fridge, with a few kitchen items in the bathroom. The bathroom has a sink sitting room separate from the shower and toilet. They have items in the closet that you can use if you go to the beach. The bed is huge and comfortable. I would highly recommend this room as it is a bang for your buck being a ocean view room. All photos were taken with my iphone. Just be aware of an additional $90 cleaning fee, taxes(13.416%), & $12/day resort fee. It actually cost us $158/day but still less then the other rooms I looked at cause they will have the same fees associated to their total cost. Honeymoon ruined - You can't smell the room from online photos - BEWARE! We booked with the same online managing company for our honeymoon in Maui and Kauai. Based on the reviews from others as well as photos posted online, we booked in Maui and this specific condo (HBR 3303) for Kauai. Quickly, the one in Maui (which we already wrote a review for) worked out ok and we enjoyed our stay. However, HBR 3303 did not go so well. While we do not disagree that the "view" is beautiful and the resort itself offers great services, we however can not and will not recommend this specific condo to anyone. As a matter of fact, our experience was so bad that we did not even stay one night. Since this is a review of the condo itself, this does not reflect on the resort as a whole and we actually had a pleasant experience checking in/out but just did not get to enjoy the services it had to offer around the resort. Here's what happened with the condo. After checking in (Friday evening) we went over to our room, once entered we immediately noticed a pungent smell (not a pleasant one). At first, we thought maybe it just needs to be aired out because the room hasn't been used for a while. As I proceeded to open the balcony (lanai) door, I noticed spider webs in the room as well as on the balcony. Which is fine to me as I don't mind spiders, but my wife freaks out about them so I just brushed them aside and pretended I didn't see them. Went back inside the room, my wife was inspecting a wooden ornamental bowl on the table with dead bugs in them. It was definitely not a good start with this condo. Being that Kauai will be the last few days of our honeymoon, we really wanted it to work and we really wanted to love this condo. We tried to air out the room and ignore the smell. As we started unpacking and slowly opening the suitcases, my wife walks into the bathroom to urinate. She flushed and the toilet backs up and water over flowed onto the bathroom floor. That basically pushed us over the edge. We called front desk, about 15-20 minutes later maintenance crew came to snake the toilet bowl. Housekeeping came after that to spray and mopped the bathroom floors. At that point, we were pretty low in our spirits and was very disappointed but not completely defeated. We decided to give it one more chance since we already paid for our three nights stay. We drove over to the local supermarket (Foodland) and bought scented candles, rubber gloves and antibacterial wipes in hopes that it will help mask the smell and wipe away any other dirty areas we see in the room. After dinner, we came back to our room and it still smelled bad, that same mix of acidic fume, almost like rotten fruits or other food gone bad. We couldn't stay, there was not a chance we could fall asleep to that smell. We called front desk and explained the entire ordeal to them starting with the bugs to the backed up toilet bowl. The lady at the front desk was very sympathetic and wanted to offer us a room but because the condo was privately owned it's really not the resort's responsibility and besides, I think they were fully booked. So we checked out that same evening we checked in. I will be more than happy to share our experience with the local management company. If they had managed things differently or cleaned the room the next day (after contacting them multiple times, following up but never hearing back from them), we might not have written this bad review. Not only did they refuse to refund our money, full or partial, they made accusations that we might have backed up their toilet bowl. The worst part and I quote, "…you're in the tropics, you're going to see some spiders and bugs…" Really?! Really?! If we were not on our honeymoon, we might not have been as upset. We definitely do not wish this to happen to any other honeymooners or simply anyone on vacation hoping to find a clean room. Beware! We regret you had a negative experience in unit 3303. We work very hard to maintain the property and have many positive reviews that reflect our commitment. We did not receive a call from you telling us there were any problems until the day after you checked out, so we did not have the opportunity to address the issues. When you spoke with us over the weekend during the several phone calls that transpired you were not accused of blocking the toilet, we just indicated that it was working fine when the housekeeper cleaned it prior to your arrival. We would have been happy to address all of the issues right away had we been informed and our policies clearly state that we reserve the right to have the opportunity to rectify any issues with the property. As you checked without contacting us, and only let us know the day after you were gone, it made no sense to offer to clean it for you. You told us your friends offered you a free place to stay when you dined with them on Friday night so you returned to the resort and checked out. We do live in the tropics here, and that means things happen fast with bugs and rooms that are closed up, so we do our best to keep up with nature and rectify any issues that arise. Our contact information is included in confirmation emails and posted in the room for any guest who needs to contact us 24/7. We are happy to help. We recently stayed in this condo when in Kauai for our son's wedding and also vacation time. We couldn't have been happier with the location of Hanalei Bay Resort. It was convenient to North and East Shore activities, shopping, and beaches. Our condo was ideally located within the resort. The pool was steps from our door and close to tennis and parking. The view from the lanai was beautiful! There is a lovely path to the beach and a golf cart at your service if you need a lift anywhere on the grounds. We found nothing lacking. All amenities were as stated. It was comfortable, clean, and a wonderful place to return to after some very busy days. My husband rented a surfboard in Hanalai the afternoon before his morning surf session for $29 that included racks, leash, wax and board insurance. Left the board overnight on the car in the secured parking lot an he woke at 6am to walk down to the backdoor of the waves. I could see his white rash gaurd from the balcony. After surfing into Hanalei he walked back via beach to room. Ideal. Also no problem not having a real kitchen, Foodmart has ahi poke in the deli, with taro chips, seaweed salad, sliced tomatoes, payaya and a coffee maker, who needs more on vacation. Aloha! Amazing view and able to hear waves from the lanai. We had a wonderful week staying in 3303. Nicely appointed small condo perfect for 2 people. Adequate furnishings, although the mattress was extremelly uncomfortable and seems to need replacing (I woke up every morning with a really sore back). Decor could use updating, but that is minor considering the good location, proximity to the parking, pool and laundry facility. I would suggsest renting beach chairs and flippers from the pool area for a nominal price to use during your stay since they are more comfortable and less worn out than those supplied at the condominium. Unfortunately, the restaurant and fitness facility are not rebuilt yet, and would be really great to have on site. We would definitely return. We loved our stay. We have stayed in other units in that same building many times, but we found this unit 3303 to be the nicest of them all. It was stocked very well,and meet many of our needs. I would highly recomend this unit to everyone. We just returned from the Hanalei Bay Resort. When choosing a hotel, I strongly recommend staying on the north shore where the views are majestic and the beaches are spectacular. Hanalei Bay Resort is located in Princeville directly above the St. Regis Hotel. I was a bit aprehensive about staying in a condo versus a hotel but I was pleasantly surprised. The only creature comforts that were missing was daily housekeeping service a bar and a restaurant. The grounds were beautifully landscaped and included two swimming pools, a jucuzzi, tennis courts, vending machines, a laundry room and ice machines. They provided lounge chairs and complimentary beach towels at the pool as well golf carts taking you to and from the beach up until 10:00 p.m. The rooms on the third floor have the best views as well as high ceilings creating a spacious feel. We stayed in room #3303 with an unobstructed view of the ocean, beach and Bali Hai. The room was located steps away from the main swimming pool, tennis courts, parking lot and beach path. The room included a king size bed, a flat screen TV, a coin operated safe, comfortable furnishings and a balcony with a spectacular view. There was a make shift kitchen with a small fridge, microwave, toaster, blender and coffee maker with filters. They even provided dishes, utensile, glassware, coffee cups, paper towels, dish soap, sponges, toilet paper, tissues, laundry soap as well as bath products. The bathroom was large with a huge counter top and a combination bath and shower. Unfortunately, the water pressure was a bit weak for my taste. The owners even provided beach chairs, snorkeling gear, boogie boards and sand toys. The staff at the Hanalei Bay Resort were helpful and friendly. We enjoyed swimming on the beaches in Hanalei Village but the beach which is shared by the St. Regis Hotel and Hanalei Bay Resort paled in comparison. We will definately return to the Hanalei Bay Resort. We very much enjoyed our stay at this condo, the view from the balcony was awesome! The condo has been nicely updated with a large flat screen tv and everything was clean and in good order, our stay there was very nice. The one downside was that it does not have a kitchen, but we were able to manage nicely with the mini fridge, microwave and toaster that were provided. The management were willing to go out of their way to make sure we had everything we needed to make our stay comfortabe. We highly recommend this condo! Wonderful little condo great price! I must say I was very impressed with this little condo. Much better than any hotel room I have ever stayed at while visiting Hawaii. The price per night is also a great deal in my opinion. Beach chairs, snorkeling gear, coffee maker, fridge, microwave were all included. There were also many books in the condo including an ultimate Kauai guidebook. I would stay here again the view was awesome and we had a very good time. It does rain a little bit more on the north shore but usually a quick passing shower that will not ruin your trip at all. From the patio there are great views of lumahai beach and Hanalei bay. All I can say is can't wait to go back!! The lock-off side we stayed in had an amazing view of both Hanalei Bay and the mountains and the sunsets were incredible. There was plenty of room and even books to read. The resort is gorgeous, not too big, and has friendly, very capable staff. We swam, played tennis, used the hot tub, took walks, and visited nearby communities, stores, & restaurants. Had a great time & have already recommended this to someone else. Great little condo. Close to parking lot and pool. The toaster was a nice touch. Close to the beach. We brought snorkel equip--was available in condo. You should put that on your website. Vents on front door nice to keep air moving. Overall great...should have housekeeping clean the cobwebs from the curtains and corners though. Unit 3303 is well equipped comfortable and very relaxing. Good access for the beach after nice walk. Nice balcony for a glass of wine at the end off the day. Wake up to a dream view. Hrb 3303 is a very nice unit with everything you need for a short stay. The view from the lanai of Hanalei Bay is breathtaking! The unit had ample seating, so it was more than just a hotel room. Also furnished were beach chairs and mats, an essential if you're planning much time at the beach. This unit has a beautiful view! We enjoyed having coffee on the lanai each morning and watching the surfers. The fridge and coffee maker were handy so we didn't ever leave for breakfast. The location is great and we had just a short walk to the beach. The bed was comfortable. When we found ants in our bathroom and made a call, the problem was quickly taken care of. The T.V. had a weird glitch and would alternate from dark to light. The unit was a bit outdated and due to the high ceilings, there were some cob webs that hadn't been attended to. All in all, for the price this was a fantastic deal with a view to last a lifetime. Thanks for making our trip a wonderful one! Comfortable, afordable room, not a great location. Pros:The accommodations were clean and comfortable and very reasonably priced for the area, and the staff was helpful and friendly. The hotel pool was huge and beautifully landscaped with waterfalls and plants. Cons:The resort is located in the middle of what seems to be a massive golf community a little bit of a drive from Hanalai Bay, beaches, forests, restaurants, and anything resembling natural or authentic Hawaii. I could go to a rich suburb of my own town to stay in a similar area to this golfing community. If you don't mind driving a ways through all the condos and golf courses to get to the more scenic/natural areas then it's great. Also, cancellation policies seem extremely strict. I hope you were able to enjoy the view from the 3303 lanai; the panoramic view of Hanalei Bay and the Makana Mountain Ridge, also know as Bali Hai, the beautiful Hawaiian foliage and the glorious colors of the sunset evenings. Also the paved path in front of the unit which is a seven minute walk (by request can be a complimentary golf cart shuttle) to the top rated white sand beach, Puu Poa Beach where you will find reef protected swimming and snorkeling. Next to the beach is the St. Regis pool side restaurant open to the public for your dinning delights. I hope you did not miss John's Hanalei Bay Resort poolside fare open in the middle of the day. John is a native Hawaiian who loves to cook "local" short order fare and, "talk story." And the price is right. If you had time to walk the resort's 17 + tropical acres you would have found native plantings along with the expanse of beautiful flowers. Hawaiian? Yes, your room furniture featured local teak wood. While the design is contemporary, the furniture was hand made by a local artisan. The quilt on your bed was authentic Hawaiian hand-made, quilted by island women. When renting at Hanalei Bay Resort, you are not in a hotel with 100's of look-a-like rooms but in a private owner's unit where individuality, quality and cleanliness are important. Located at the water's edge of Hanalei Bay and the Pacific Ocean, yes, you do have to drive by condos to arrive. When it was originally built over 30 years ago we were without neighbors. Progress brings company but you have to agree that the spacious property is the top spot on the island and perhaps worth the effort.